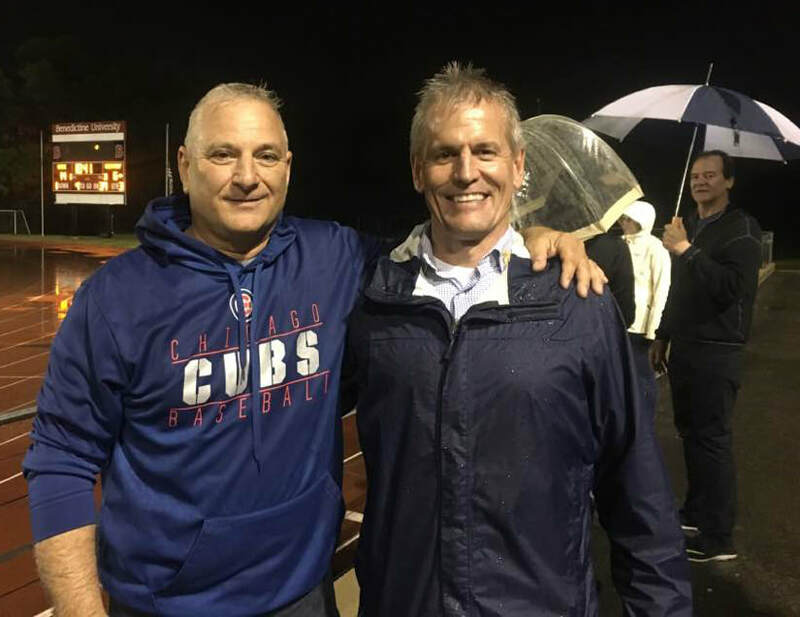 A sloppy and rainy night didn’t dampen the spirits or enthusiasm of the alums who attended “Alumni Night” at the Lisle-Westmont football game, October 6 at Benedictine University. 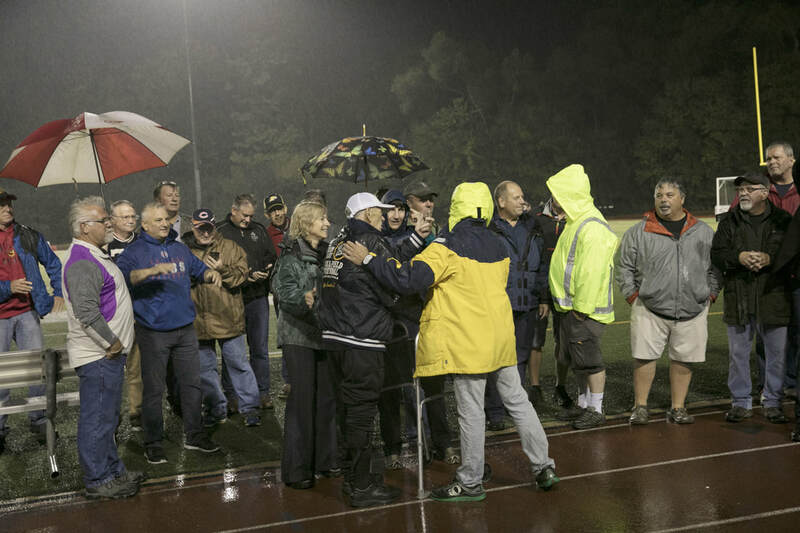 This was the third Alumni Night sponsored by the Carlin Nalley Foundation and Lisle High School. Every other year, the Lions have five home games instead of four, so the extra game has been set aside for alumni celebrations. As has been the case the previous two, this year’s Alumni Night festivities began with a rousing tribute to our military alums. In conjunction with Scott Gumina and his Marching Lions, the military alums marched into the stadium to a rousing rendition of their branches’ theme song. 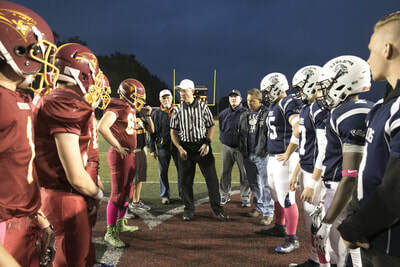 Then after the two teams warmed up and the band performed “On Ye Lions” the mood turned somber. One by one, the names, ranks, and details of their loss was read for the five Lions we’ve lost while in service to our country. Then after a protracted moment of silence, one of the Marching Lions spun around faced, the crowd, and played “Taps”. Military in attendance saluted, many others in attendance wiped a tear or two. Almost as if on cue, the bells of a nearby church tolled somberly at the seven o’clock hour. A vital and moving tribute. The mood turned to celebration at halftime of the varsity game as football team members of “The Streak”, the 59-game conference undefeated steak gathered on the track in front of the crowd. First the program’s leader and Illinois Hall of Famer coach Carlin Nalley was introduced and acknowledged by the crowd. Then the year by year the accomplishments of the teams, staring with the 1972-73 team were read as the crowd cheered each season’s accomplishments. An impressive roll call followed as the entire rest of the decade of the 70’s illustrated the dominance of Lisle football. After the final championship season was recapped and the crowd applauded the group, the team gathered around their coach as hugs and high fives capped the tribute to a terrific era in our school’s history. ​Bobby Jenkins (not Opie Taylor) trying on brother Roland's Letterman's jacket. 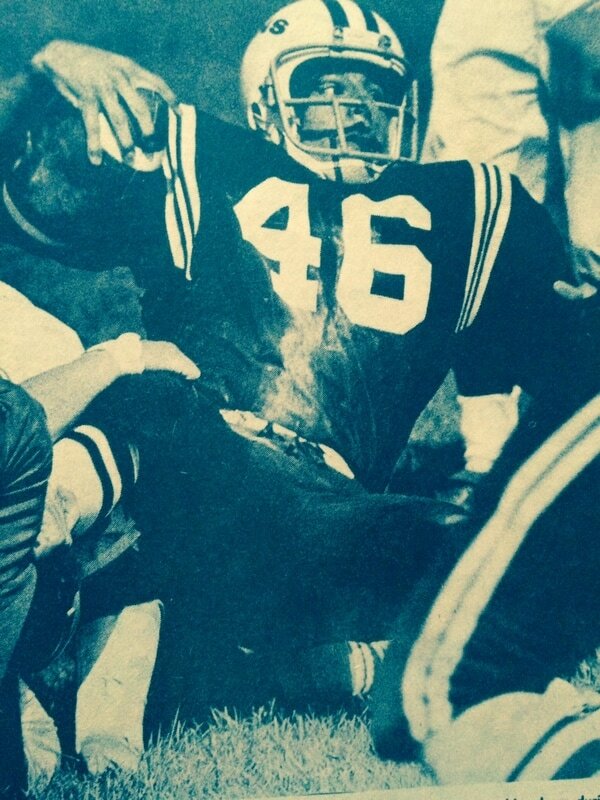 Roland was a standout player on Lisle's first Conference Champions the 1963 Lisle Football Lions. 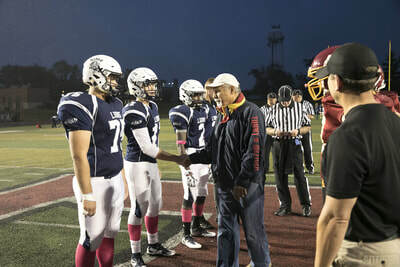 Bobby was the starting quarterback for the Lisle Football Lions in 1972 when the streak began. From the 2nd conference game of the 1972 season through the 2nd one in 1980 the Lisle Lions did not lose a regular season conference contest. Fifty-nine consecutive conference games, spanning parts of these nine seasons, saw Lisle football emerge as a state and regional powerhouse along with the six straight Northeast Conference championships and therefore a berth in the first six years of the IHSA State Playoffs. Wilde Field was the place to be as the parking lots and local streets were full of cars, the booster club grills were cranking out sandwiches and Affy Tapples were consumed by the crate. The Carlin Nalley Foundation will be regognizing the athletes, coaches, and operations people who were such a big part of this decade-long story during the festivities surrounding the All-Years Reunion “Rockin’ the Foundation” October 7, 2017. First, the Carlin Nalley Foundation has been releasing excerpts from a compilation of articles from the half dozen newspapers that covered football in the 1970s. 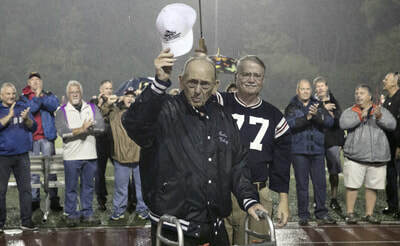 These excerpts can be found in the “Alumni Blog” http://www.carlinnalleyfoundation.org/lisle-alumni-blog Foundation President and compilation editor John Bartels (’85) and his board gave the first draft of the entire document to Coach Nalley at his 80th birthday party in February. More and more of the excerpts will be released over the next few weeks and the final document will be presented The Coach and available on line after the All-Years reunion. On Friday night, October 6 at Benedictine University, the teams and team members from The Streak will be honored between games and at halftime as part of Alumni Night. All participants are asked to be there by 6 pm for badges, instructions, and timeframes. The teams from The Streak will be recognized on the field in a special ceremony between games and at halftime of the Varsity contest. So bring your family and friends, take in some Lions football, join your former coaches and teammates, and help us make this a special night for all. The following morning, 11 am at Wilde Field, the Carlin Nalley Foundation is gathering the alums from The Streak along with anyone who played football under Coach Nalley to join in a team photo in the bleachers as an 80th birthday gift to The Coach. The photo will take place rain or shine (we can move indoors if needed) PROJECT 200 is the name for this event as the Foundation Board is targeting at least 200 former team members be there to help celebrate The Coach’s birthday. A number of footballers will then be asked to stay for a second picture as our Hall of Fame track coach will sit for a second photo with those who participated in Track and Field during his storied career. 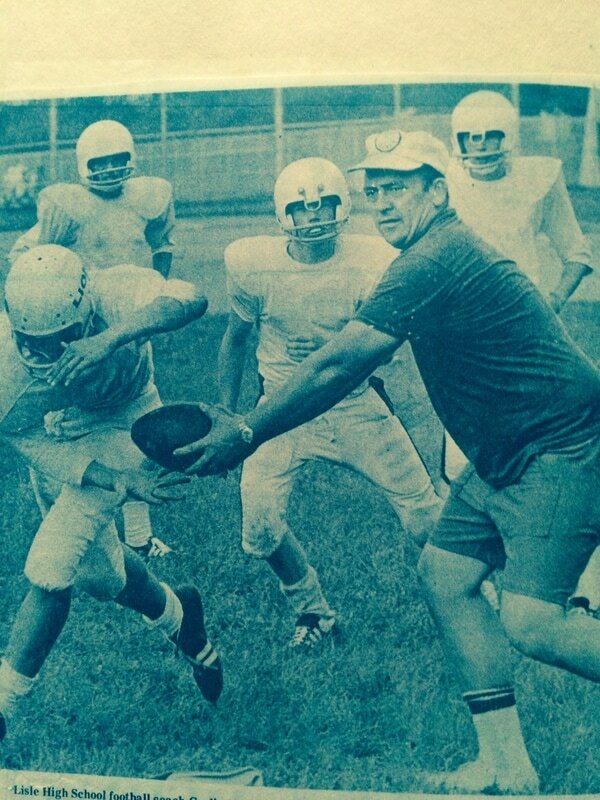 Lisle Lions football was a "happening" for most of the decade of the 1970s. In 1972, Lisle lost at Plano on a last minute turnover. The Lions wouldn't lose another conference football game until 1980. Fifty-nine consecutive games without a conference loss followed that heart-breaker in Plano. Lisle was a powerhouse and Wilde Field was an electric place to be on those autumn Saturday afternoons. The Carlin Nalley Foundation will celebrate those fantastic teams and years during the weekend festivities surrounding the All-Years Reunion weekend, October 6 and 7, 2017. On this, the sixtieth anniversary of Lisle Senior High School, and coach Carlin Nalley's 80th birthday, the Carlin Nalley Foundation is editing and producing a compilation of stories, articles, and photos from that magical 59-game streak. We are pleased to present one story from each of the 1972 through 1979 seasons. We want you to get a feel for what our project will look like when completed as we recap each entire season, game by game, through the stories written by the state and local media.. The entire finished project will make its debut at the All Years Reunion in October. In the mean time, please enjoy these single snippets from each season. Just a snapshot of what each season's recap will look like. See you at the All Years Reunion......"Rockin' the Foundation"
Announcing a Special Recap of "The Streak"
​Greetings to All- I am pleased to present this recap of a wonderful and exciting time in the 60 year history of Lisle Senior High School. For most of the decade the Lions fielded dominant football teams, year after year, resulting in a 59 game streak where the Lions did not lose a regular season conference game. Autumn Saturday's during that period seemed to be made for football at Wilde Field. Large and enthusiastic crowds showed up for each and every home game. Grade schoolers in 1972 came to the games dreaming of the day they'd be wearing the Navy and White, only to be the athletes that continued the streak in 1979. This year the Carlin Nalley Foundation honors the players, coaches, and cheerleaders from that amazing period and what better way than a commemorative recap of the seasons involved. Taken from the pages of local papers such as the Lisle Sun, Suburban Life, Aurora Beacon-News, The Suburban Trib, and even the Tribune and Sun-Times out of Chicago, I invite you to read about the seasons that comprised this special time in our school's sixty year history. Editing this compilation of past articles brought back terrific memories of growing up in Lisle in the 1970s. I hope you'll enjoy this walk down memory lane. A "Sneak Peak" into what is to Come! The Carlin Nalley Foundation is producing a recap of the seasons that comprised the Lion's streak of 59 regular season conference games without a loss in advance of honoring those teams at Alumni Night, October 6, 2017 at the Lions home game. The game will be held the night before "ROCKIN' THE FOUNDATION", our next All-Years Reunion. We are pleased to release this excerpt from the upcoming recap of the teams and seasons that comprised the winning streak.